The Earned Value Management (EVM) is a well-known and widely used technique, to monitor and control the budget of a project. Since there are a lot of good books and posts about the theoretical approach to EVM, we will walk through it following an applicative perspective. The followed approach will enable us to apply EVM concepts to real situations, right from the beginning. 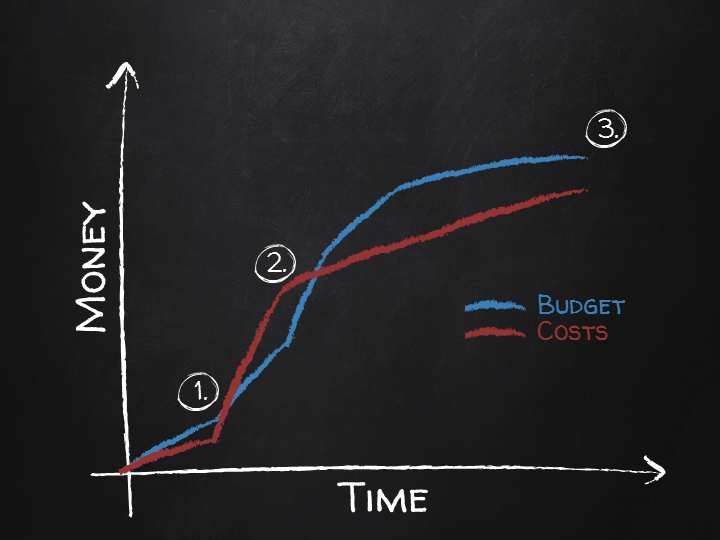 Let's consider the budget/cost situation of a project, as shown in Figure 1. What can we say about the project's performance? Are we happy with it? 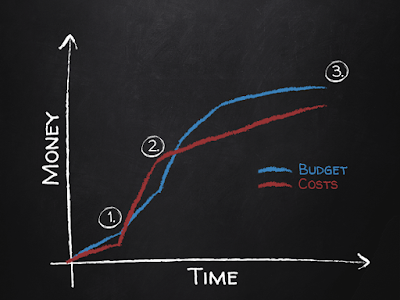 Figure 1. budget/cost situation of a project. The truth is, simply we do not know. We do not even have a clue about the performances of the project, because we lack an essential dimension, other than Time and Money. We lack the percentage of scope implemented at any point in time. Taking a look at Figure 1, we can clearly understand if we are ahead or behind the budget, but what about the schedule? We are underspending, which is good...but how about the deliverables completed so far? What about the schedule? We are spending, let's say, 40% less than expected, but maybe we just have delivered 15% of the planned scope. We are behind the budget, which is not good...but maybe we already have delivered 95% of the scope, and we are dramatically ahead of schedule. Ok, we saved some money, but have we delivered everything we were supposed to produce? EVM comes into play to answer the questions raised in the previous points. First, let's introduce a little bit of jargon. I know, it is a bit annoying but EVM, for historical reason, uses the terminology of its own to define standard variables. The budget of the project. Budget is called PV in EVM techniques, to stress the idea that it represents the quantity of money we plan to have spent up to a precise moment of the project. The quantity of money spent so far in the project. 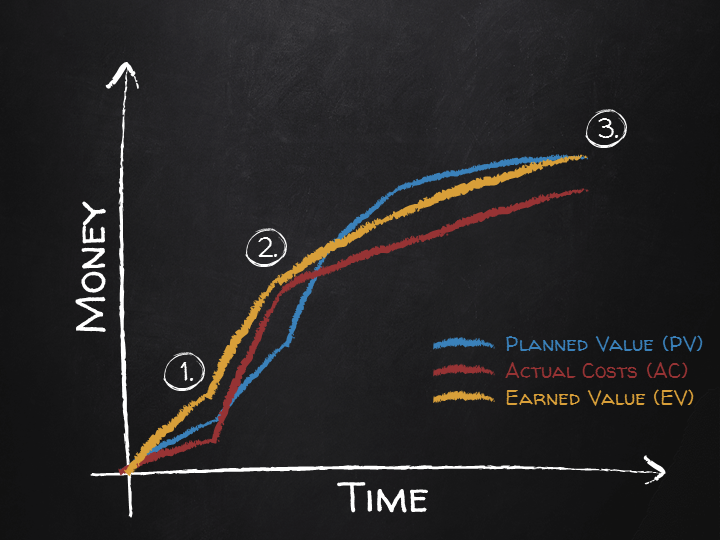 Earned Value is the dimension we lacked in Figure 1, that is to say, the value generated from the project up to a specific moment. We could also define EV as the budgeted cost of the work performed so far. The correct determination of the EV can be a little tricky; it is usually evaluated as the sum of the figures of the budget forecasted for the generation of the completed deliverables. The budget for partially completed deliverables may be counted in using an estimated percentage of completion. The effort for not directly measurable activities may be considered in the evaluation using an apportioned effort approach. We will come back more in detail to the topic in a future post of this series. Obviously, EV at completion is by definition the budget of the project. If scope is added or removed, the budget is modified to reflect the changes. The assumption made here is that our budget is a meaningful figure and that the efforts for the comprised activities have been estimated reasonably well. In any case, EVM technique gives us tools to prove the truthfulness of our assumptions, and to remodel the budget during the project's execution. Coming back to our previous example, we can now say more about the project's performance. We were underspending, and we completed more scope than expected. That's very good; ahead of budget and ahead of schedule. We were behind the budget but still ahead of schedule. Not bad, even if, in a situation like this one, there is the possibility to incur in a cash-flow problem for the project, if not enough funds had been allocated by the time. On schedule and ahead of budget. What else? In the next post of the series, we will show how to use EV, AC, and PV to keep the project under control.